The cofounders of Solar Impulse and Solar Impulse 2, Bertrand Piccard and Andre Borschberg, aim to raise awareness of climate change and the importance of using renewable/solar/clean energy. 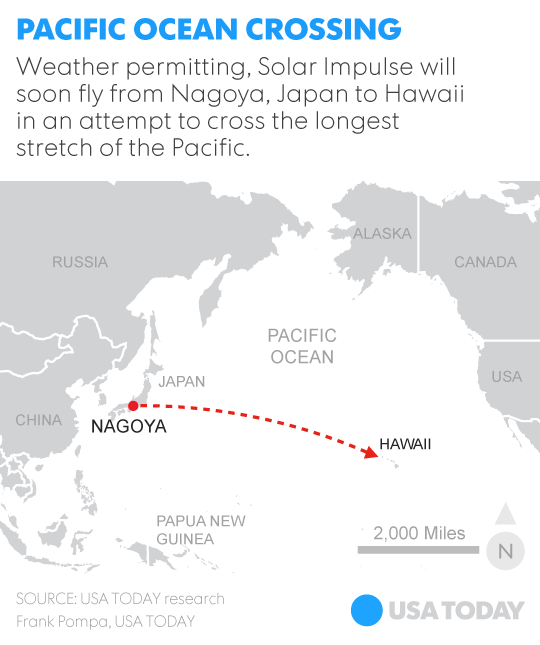 Weather permitting, we shall soon see Solar Impulse 2 crossing the Pacific, from Nagoya, Japan, to Hawaii, on this longest solo flight of all time. Despite difficult weather condition during its seventh leg from Nanjing, China to Honolulu, Hawaii, or its wing damage upon arrival in Japan, Piccard and Borschberg have overcome much obstacles and have been patient and cautious in waiting for a period of four days of good weather condition to take this longest solar powered flight coming up this weekend. Let us wish these two visionaries, Piccard and Borschberg, and their Solar Impulse Team and family, plenty of sunshine during this upcoming journey crossing the Pacific. The whole planet will be rooting for you! It is mostly due to the energy and optimism of pioneers such as Bertrand Piccard and Andre Borschberg that we have been able to see the solar industry reaching its maturity during this past decade. We are thankful that there are people such as Bertrand, Andre, and the Solar Impulse Team to have brought forth a futuristic dream into reality. Here in USA, let’s join the challenge in taking part in completing their next project of flying in a solar plane around the world in HB-SIB. Join the challenge by becoming a Friend, Adventurer, Innovator, Explorer, or Pioneer of Solar Impulse! Get Ready To Hangout With The Solar Impulse Team! Solar Impulse will be taking off from Lambert-St. Louis International Airport (MO) for Washington Dulles (VA) tomorrow Friday June 14th around 4 AM CDT (UTC-5). Piloted by André, it’s expected to be a challenging flight due to high cross and headwinds. Because of this, Solar Impulse will do a pit stop at Cincinnati Municipal Lunken Airport (OH) in order to change pilots, rest and take-off the following morning with better weather conditions. With Bertrand at the controls, the solar airplane will take-off the next morning, Saturday June 15tharound 8 AM EDT (UTC-4) and land in the nation’s capital sometime after midnight EDT (UTC-4). Follow this flight live streaming and virtual cockpit on our website with key interviews and highlights about previous flights. The show start one hour before scheduled take-off. Content is constantly added to the site throughout the flight such as photos, blog articles and flight updates on the flight chart below the live video! After the Ask Me Anything (AMA) on Reddit.com, our pilots André and Bertrand will do a live Hang-Out, from the air and from the ground, with Google Science Fair. The Hang-Out will open a couple of hours after take-off and will last 30 minutes; the exact time is yet to be determined. If you want to join this unique event, click here. The Hang-Out will be moderated by Olga Garcia of Google Science Fair while Gavin Ovsak, AB Duke Scholar and Biomedical Engineering and Computer Science student at Duke University, will be asking questions. The fun part is that you too might get a chance to ask something! Just post your question on theHang-Out page; three of them will be drawn and submitted to Gavin to ask the pilots. The Hang Out will be an international event with Olga moderating from Austin (TX), one pilot in St. Louis (MO), one in the air, Gary, the technical coordinator from Scotland, and David of Solar Impulse TV from Payerne (Switzerland)! Also, as a token of appreciation to all our supporters, we will be drawing at random 5 names to speak to the pilot while flying! More information will be added on our website and during the live streaming of the flight. Please be aware that the flight schedule could change before Friday if the Flight Director orders to fly another day or change the itinerary. You can regularly check the Solar Impulse website for the latest news concerning the flight or other updates. Reaching the capital of the United States is very symbolic as it will be the first to last stop of this coast-to-coast journey in a solar airplane. It’s also the nation’s central nervous system where political decisions are made and bills are passed. 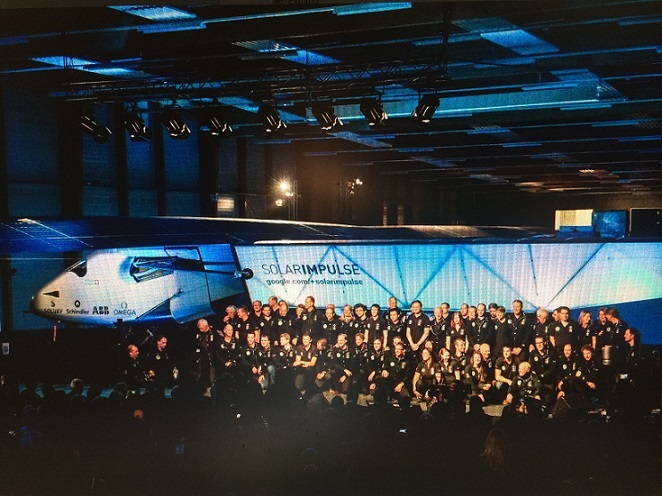 Solar Impulse will present its Clean Generation initiative, meant to inspire people and incite politicians, policy makers, businessmen and the public to adopt clean technologies. Secretary of Energy Ernest Moniz will visit the airplane during the prize giving ceremony by the Solar Energy Industry Association for the category Solar Innovator Award this coming Monday June 17th while a breakfast will be held on Capitol Hill on Wednesday June 19th. The Solar Impulse team will organize an Open House, Sunday 16th of June, come whenever you want between 1PM and 5 PM! The HB-SIA will be at the Steven F. Udvar-Hazy Center, free entrance. Get the directions here. 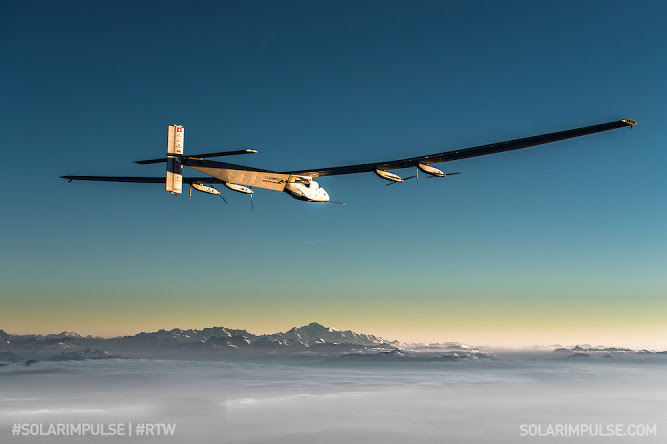 Be sure to send/email/tweet your questions, comments, jokes to The Solar Impulse ! Solar Impulse to use for first time a revolutionary inflatable hangar after damage to St. Louis Hangar. Take a look at this Inflatable Hanger. DALLAS (TX), June 2, 2013 – The strong storms that struck the St. Louis area Friday night have rendered inoperable Solar Impulse’s hangar at Lambert-St. Louis International Airport. The solar-powered airplane of Swiss pioneers Bertrand Piccard and André Borschberg remains scheduled to fly from Dallas/Fort Worth International Airport on Monday, June 3, to St. Louis. To protect the aircraft upon landing after midnight CDT (UTC-5) on Tuesday, June 4, Solar Impulse will deploy a revolutionary inflatable structure for the first time. Multiple tornadoes touched down in the St. Louis region Friday night and caused damage to several Lambert-St. Louis International Airport’s buildings including the hangar reserved for Solar Impulse. Postponing the flight is not an option, as the particularly difficult weather conditions in the region leave only very few flight possibilities between Dallas-Fort Worth and St. Louis, and it might be the only one this week. If Solar Impulse doesn’t seize this opportunity, the chances of reaching final destination of the Across America Mission as scheduled could be compromised. Pilot Bertrand Piccard will therefore take-off Monday morning for a 21 hours flight, — his longest flight in the single-seat cockpit to date. But because of the damage caused to the official hangar in St. Louis, Solar Impulse will attempt to use its own inflatable hangar to park the aircraft. Conceived and designed by the Solar Impulse team for the world tour of 2015, this revolutionary structure will be used for the very first time in real conditions. The team will only have a few hours to deploy this innovative structure before the airplane arrives. Starting Saturday, Lambert-St. Louis International Airport has mobilized its forces to help Solar Impulse reorganize and confront this extraordinary situation. The Logistics and Mission teams are working hand-in-hand around the clock to face the challenge of bringing the airplane safely to St. Louis and ensuring its protection upon arrival. The stopover in St. Louis during the crossing of the United States is very important and symbolic for Solar Impulse. St. Louis was chosen as the Midwest stopover to pay homage to the city’s aviation legacy, which includes aviation pioneer Charles Lindbergh and his “Spirit of St. Louis,” the first airplane to fly from New York to Paris non-stop. After St. Louis, Bertrand Piccard and André Borschberg will continue to alternately pilot the solar airplane to reach Washington, D.C. and New York. The Solar Impulse Across America mission is made in partnership with Solvay, Schindler, Bayer Material Science, Swiss Re Corporate Solutions, Sunpower and the Swiss Confederation. Although the flight has been confirmed, the flight director may still decide to postpone it or alter the route shortly before take-off. Keep up to date with the latest news at www.solarimpulse.com. During the Across America mission, each flight will be streamed live on www.solarimpulse.com as well as on Twitter andFacebook. The airplane’s position, altitude and speed will be shown in real time, while cockpit and mission control cameras allow viewers to experience the journey. Swiss pioneers Dr Bertrand Piccard (Chairman) and André Borschberg (CEO) are the founders, pilots and the driving force behind Solar Impulse, the first airplane that can fly day and night without fuel. Solar Impulse is a unique adventure that aims to bring emotions back at the heart of scientific exploration, a flying laboratory to find innovative technological solutions for today’s challenges and a vision to inspire each of us to be pioneers in our everyday lives. This revolutionary carbon fibre airplane has the wingspan of a Boeing 747 (63.4m / 208 ft) and the weight of a small car (1,600kg / 3,527 lb). It is the result of seven years of intense work, calculations, simulations and tests by a team of about 80 people and 100 partners and advisors. A plane so big and light has never been built before. The 12,000 solar cells built into the wing provide four 10HP electric motors with renewable energy. By day the solar cells recharge the 400kg / 881 lb lithium batteries which allow the plane to fly at night. Let’s hope for much better weather condition in the coming week. For our continued report on Across America Mission of Solar Impulse. Solar Impulse HB-SIA will be getting ready for its third leg between Dallas, TX and St. Louis, MO on Monday, June 3, 2013. There seems to be a positive weather window opening up this Monday, June 3rd, for Solar Impulse to continue its Across America mission. With Bertrand at the commands, the solar airplane will take-off from Dallas Fort Worth International Airport around 4:30AM CT (UTC-5) to complete the third leg of the journey that will lead it to Lambert-St. Louis International Airport (MO). Landing is scheduled after midnight CT (UTC-5). This tornado-stricken region, characterized by high turbulence and strong winds, has made it quite challenging to find the appropriate conditions to continue the adventure. But things seem to be clearing up and Solar Impulse is excited to discover the symbolic city of St. Louis. On the footsteps of aviation pioneers, Bertrand and André want to awaken people’s pioneering spirit and St. Louis is the perfect place to do so. In fact, early US aviation history can be tracked back to the days when Charles Lindbergh transported US Mail between Chicago and St. Louis before his attempt to cross the Atlantic. Even though the historic “Spirit of St. Louis” was built in San Diego (CA), it was St. Louis businessmen and entrepreneurs that had the knack for exploration and financed the adventure that successfully led Lindbergh to fly from New York to Paris in 1927. In fact, the airport in St. Louis was named after an important St. Louis businessman, Albert Bond Lambert, who contributed to financing the crossing of the Atlantic. For those of you that are in the St. Louis area, the Solar Impulse team is working hard to organize an Open House for the public to come see the solar airplane with their own eyes! Although not yet certain, we like to be optimists so you should too! Sign up here to get your name on the Waitlist; we will then inform all registered persons directly about the date and time of a potential visit. Please be aware that the flight schedule could change before Monday if the Flight Director orders to fly another day or change the itinerary. You can regularly check the Solar Impulse website for the latest news concerning the flight or other updates. Solar Impulse is not only about showcasing the potential of clean technologies, but about spreading a message. As part of the Clean Generation initiative, launched with the Across America mission, Solar Impulse wants to inspire and incite politicians, businessman and ordinary people to invest in clean technologies. The more people that join the movement the stronger the message; for this reason, a custom-designed flag displaying the Clean Generation slogan and the name of the destination city, will be carried in the cockpit during each leg together with a USB key. The key virtually carries the names of Solar Impulse supporters across the United States. If you would like your friends or family to be part of this pioneering adventure and cross the country with you, tell them to sign up today and become a friend of the project. Be sure to keep checking Solar Impulse website for more updates. Updates on our Solar-FIT For Sunshine State petition: 163 signatures strong. We need more! Please help us to spread more sunshine by signing this petition and sharing it with others. It is our shared responsibility to move toward the renewable energy age and Sunshine is the cleanest, healthiest, and least war-prone way to go! Thank you. Due to the ongoing Across America mission of Solar Impulse, I’d like to share one of our earlier posts from 2011 on: Solar Plane, the Swiss Solar Impulse HB-SIA, below, undertaken at the Ecole Polytechnique Federale de Lausanne. This project was initiated in 2003 and then promoted by Bertrand Piccard (who co-piloted the first balloon to circle the world non-stop);it has grown to a multi-disciplinary team of 50 specialists from six countries and assisted by about 100 outside advisers. What a terrific way to prove that we, the earthlings, are capable of freeing ourselves from the dependence on oil ! Through the clean tech of solar energy, SOLARIMPULSE has brought us not only the physical possibility of the first manned flight over night (lasted about 26 hours) by solar powered plane in July 2010, but also the message to educators throughout planet earth the importance of motivating children and students the pioneering spirit and developing new ways of thinking about future, energy, environment , and online education. The prototype HB-SIA has a non-pressurized cockpit, a similar wingspan to the Airbus A340, lithium polymer batteries under the wing, 12,000 photovoltaic cells on the upper wing surface and the horizontal stabilizer generate electricity during the day. 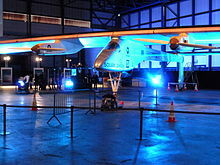 These photovoltaic cells and horizontal stabilizer propel the plane and charge the batteries to allow night flight, theoretically enabling the single-seat plane to stay in the air indefinitely. 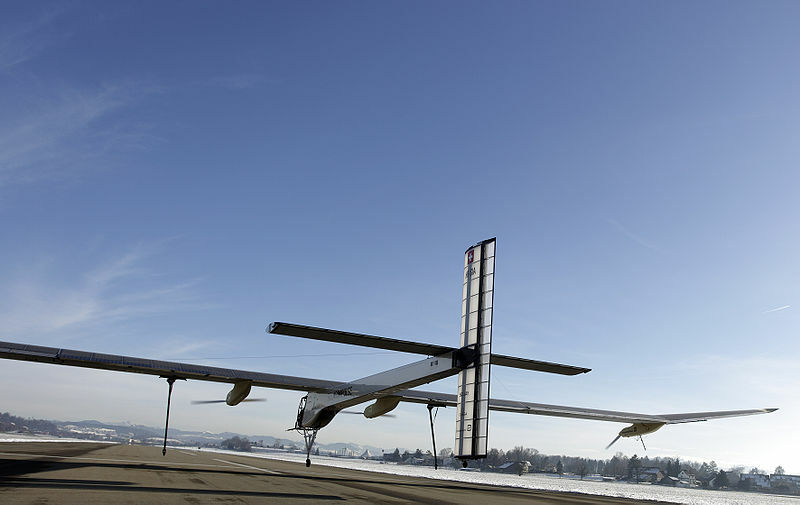 On July 8, 2010, HB-SIA achieved the world’s first manned 26-hour solar flight, flown by Andre Borschberg (started on July 7, 2010, from an airfield in Payenne, Switzerland). To top HB-SIA, the HB-SIB is planned in the future, with a pressurized cockpit (with supplemental oxygen and various environmental support to the pilot to allow a cruise altitude of 12,000 m (39,000 ft) and advanced avionics to allow for transcontinental and trans-oceanic flights, with wingspan of 80.0 m (262.5 ft), slightly wider than the 79.75 m (261.6 ft) wingspan of an Airbus A380 ( the largest passenger airliner in the world). Solar Impulse HB-SIB requires the development of new materials and construction methods. Solvay has invented electrolytes that allow the energy density of the batteries to be increased;Bayer Material Sciences is utilizing its nanotechnologies for this project;and Decision is using lighter carbon fibers than seen in any previous projects. HB-SIB will undergo the same structural strength and vibration testing as for HB-SIA. Flight testing for HB-SIB is planned for Spring of 2014 and the round-the-world flight for between April and July of 2015;the flight would circle the world in the northern hemisphere near the equator and five stops are planned to change pilots. Once improved battery efficiency allows the reduced weight, a two-seater is envisaged to make a non-stop circumnavigation. Another lesson I have learned from this project…the importance of spirit of cooperation among all earthlings….it is time to shed the barriers of nationalism in order to reach the survival of humankind/earthlings…. Your comments, questions, suggestions are always welcomed either publicly (via comments below) or privately (via sunisthefuture@gmail.com).